Well, I made a lot of tweaks to my pedal setup. I’m running a LOT of stuff through the effects loop of the amp. The ME-50B just sounds better there, although I tend to get some artifacting in the sound when I play really loud and having the compressor in the effects loop can sometimes really bring out some 60Hz hum. Some of the effects work way better though, especially the pitch tracking things, like the synth settings and the octaves. Those work more effectively. I’ve since decided that the artifacting is not the only negatives here. The distortion settings just don’t work with this setup. The sound of them is terrible and they’re oddly quiet, even when I crank them – All I get is the artifacting. 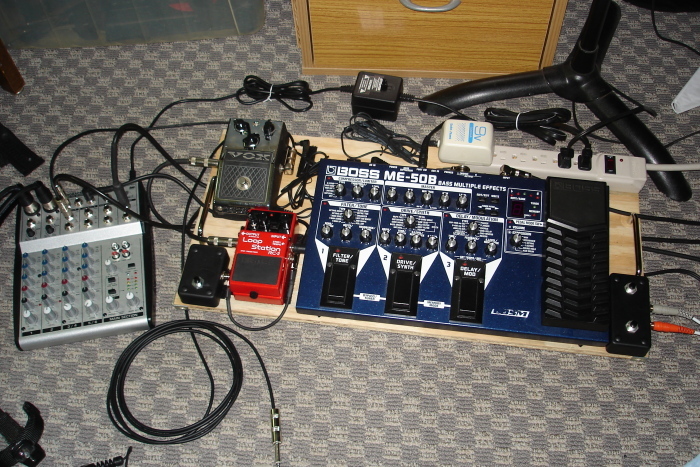 I also noticed the modulation effects like wah, chorus and phaser caused way more feedback with this setup. So I’ll deal with the glitching of the synth and octave effects to have everything else working correctly. Still running the mixer throught the effects loop to pick up the microphones. Since my amp has no overdrive I’m still running the Vox before the amp, to use basically as my overdrive channel if I should want it. It gives me some serious hum when powered on a daisy chain though – luckily it is true bypass, so I can still leave it in the chain without actually pluggin it in! Here’s the picture of the final product. Bassoon – Preamp – Boss ME-50B – Vox – Amp – Effects send – Mixer (receiving input from two GLM-100 Mics) – Mixer Mains out – Boss RC-2 Loop station – Amp return. Getting the mixer in there means I get the natural sound of my mics and the effected sound of the pickup, can blend them, and both can be recorded by the looper. The Vox is where it is to mimic a gain channel on an amp (my amp has none). For some reason when it’s ahead of the ME-50B I get more squelch too, so it’s better placed later. Both of the Boss pedals have homemade tap tempo switches, two for the ME-50 and a single for the RC-2. These tap tempos require NORMALLY CLOSED switches, NOT normally open, like it says almost everywhere on the internet. Trust me, they need SPST-NC switches or they don’t perform their functions properly. You’ll have to go to Digikey or some other specialty stores (not Radio Shack) to find foot-friendly NC switches. One last thing: Radio Shack brand soldering irons are absolute crap. Don’t waste your time.